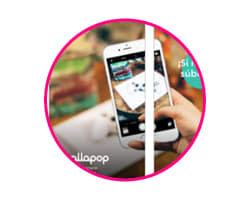 Wallapop is a mobile virtual flea market/classifieds app where users can buy and sell used items in their area. It is the leader in the Spanish C2C mobile, e-commerce industry and recently merged with LetGo to penetrate the U.S. market. For a marketplace company like Wallapop, growth means optimizing for two audiences that feed upon one another. More specifically, Wallapop cannot grow buyers without growing the inventory, they cannot grow the inventory without growing sellers, and they cannot grow sellers without growing buyers. 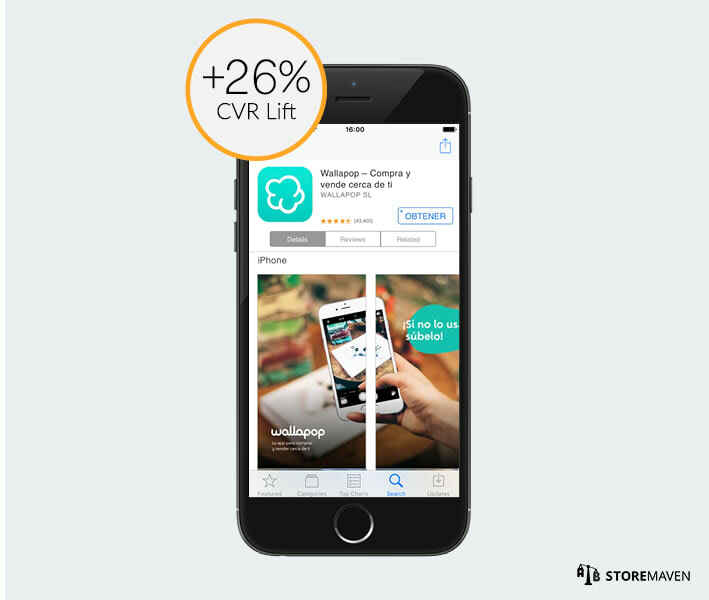 Since there is only one app store that both buyers and sellers (with their varying needs) land on, Wallapop needs to convey the best messaging that will optimize conversion rates for both audiences. Everyone lands on the same App Store Product Page regardless of how they got there (e.g. organic traffic, cross promotion, and paid traffic). However, users behave differently before deciding to install or leave a Product Page. One of the major takeaways we have gained from analyzing how more than 500 million users behave on the App Store and Google Play, is that we can classify users into two distinct groups based off their behavior patterns. Decisive Visitors — users who decide to install or leave without ever engaging with the page. In other words, these visitors are only exposed to creatives that appear in the First Impression Frame (everything above the fold), and their first and only action is either tapping the install button or leaving the page altogether. 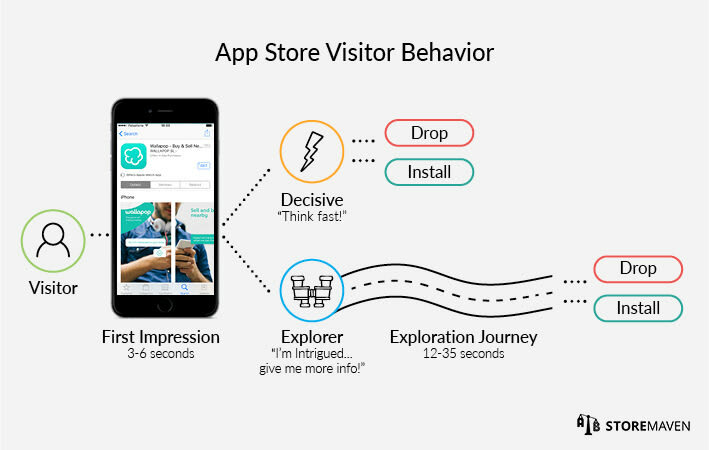 Decisive visitors represent 60% of all app store traffic. Exploring Visitors — users who choose to browse through available content on a Product Page to make a more informed decision before installing. Explorer Visitors represent the other 40% of all app store traffic. Decisive Install Rate The install rate of Decisive Visitors. Exploration Rate: The rate of visitors who engaged with the Product Page. Explore Install Rate: The install rate of Exploring Visitors. 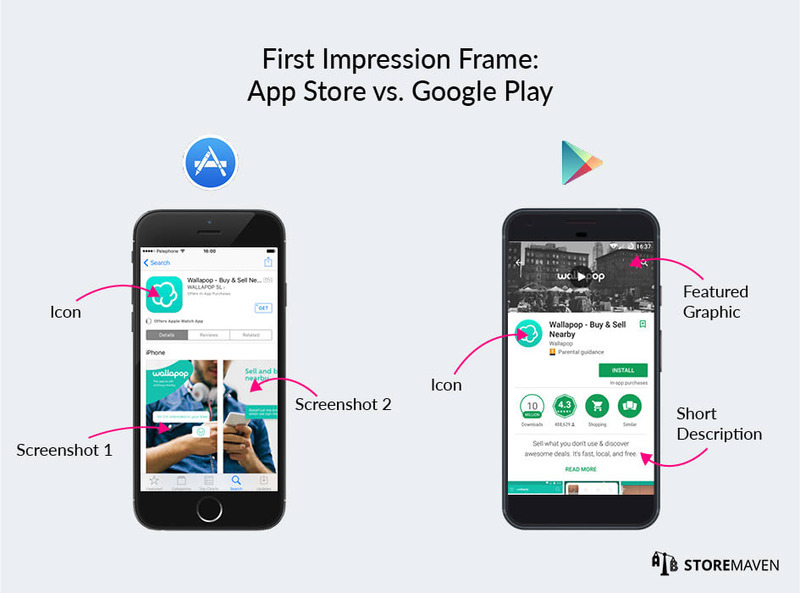 It is important to note that the First Impression Frame is significant for both the App Store and Google Play, but assets found in the First Impression Frame differ across platforms. Hence, what works for one platform will not necessarily work for the other. More on this here. 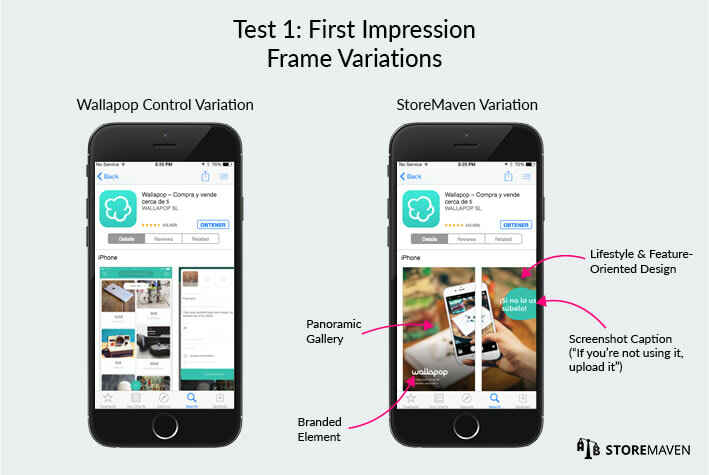 The most dominant asset in the First Impression Frame on the Apple App Store is the First Impression Gallery (the first two App Preview videos/screenshots in the Gallery), while the most dominant asset in the First Impression Frame on Google Play is the Feature Graphic. 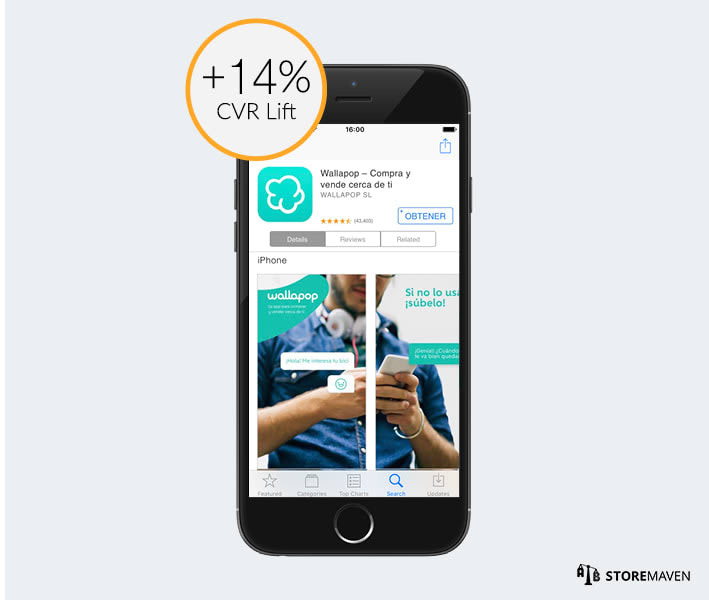 Since we were focusing our optimization efforts on Wallapop’s Apple App Store Product Page, we knew that redesigning the First Impression Frame with a focus on the Gallery would boost conversions. Test 1 would focus on redesigning the Product Page based on best practices within the mobile, e-commerce industry. Test 2 would focus on optimizing the winning Store by implementing insights from the first test, while testing new messaging. 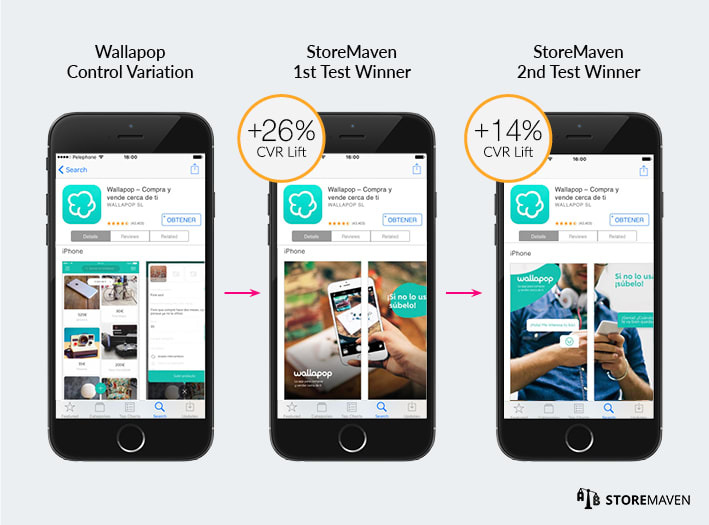 The goal of our first test was to enjoy a quick win by completely redesigning Wallapop’s App Store Product Page based on best practices we have compiled from analyzing the behavior patterns of millions of App Store users. 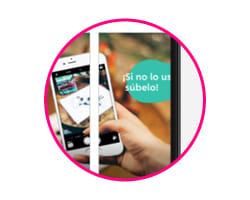 Redesigning Wallapop’s First Impression Frame by incorporating four best practices will increase App Install Conversion Rates. 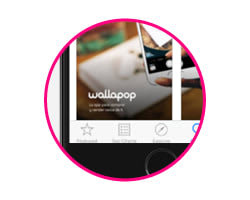 Our strategy for redesigning Wallapop’s First Impression Frame centered on four main initiatives. Screenshots are the most impactful asset in an App Store Product Page. We classify screenshots into three overarching types: feature-oriented (direct screenshots from within the app), lifestyle-oriented (images with real-world elements such as people engaging with their cell phones, outdoor settings, etc. ), and art-oriented (images that are illustrations and not screenshots or real-life images). To better convey app utility and raise interest, we decided to utilize a hybrid design of lifestyle and feature-oriented aspects. We have found that visitors do not spend a lot of time or effort in attempting to fully understand app screenshots. One way to make screenshots more quickly intelligible, and increase the odds that visitors actually absorb the messaging, is by adding short and concise captions. When screenshots have captions, users do not have to invest much effort in discerning the messaging behind the images. We decided to incorporate a caption that reinforced the messaging of the design (e.g. “If you’re not using it, upload it”). A Panoramic Screenshot Gallery is often used to encourage users to scroll through the Gallery set. Panoramic Galleries provoke curiosity as visitors naturally want to see the “entire” image. 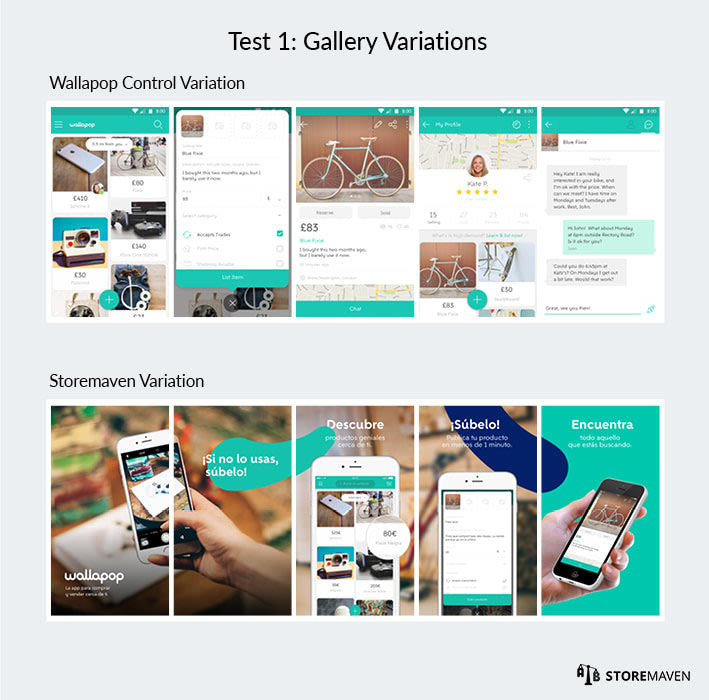 We decided to utilize panoramic Gallery images for the first two screenshots to create a holistic First Impression Frame that encouraged Gallery engagement. One of the most important factors in App Store Marketing is designing marketing assets that speak the same language as a company’s brand. One way to achieve this is by incorporating a brand’s logo and/or colors from a brand’s palette. We decided to incorporate Wallapop’s logo and colors in the Gallery assets in order to communicate and reinforce brand identity. Within 5 days, we were able to reach full statistical confidence in the winning variation. The StoreMaven variation created a +26% CVR lift and became the new control for our second test. 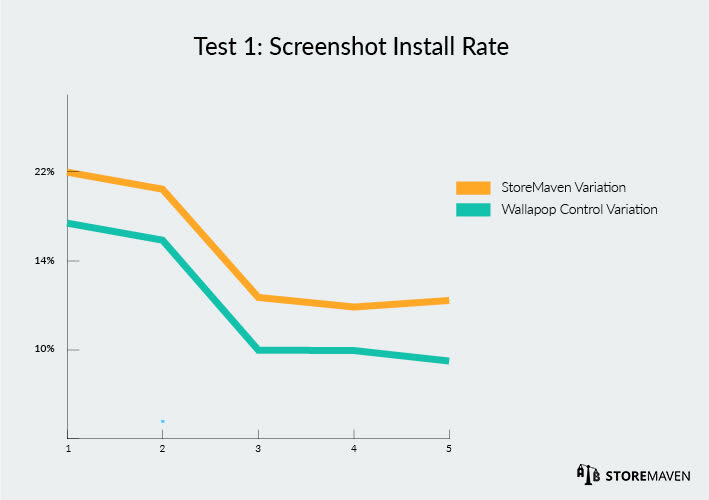 As depicted in the graph above, Wallapop’s Control Variation encouraged more users to explore, but it was not successful at encouraging those users to install. 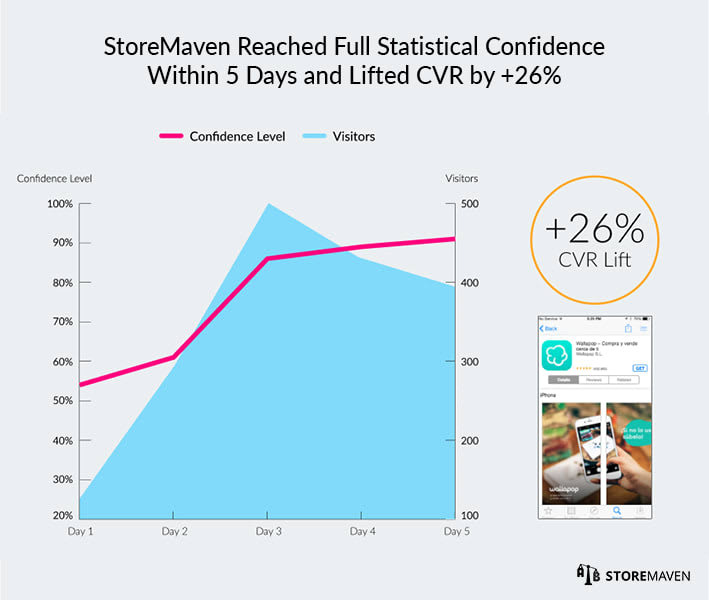 The redesigned StoreMaven Variation created a more optimal exploration journey that led to a greater number of installs. The Gallery is the most significant asset that Explorers engage with. 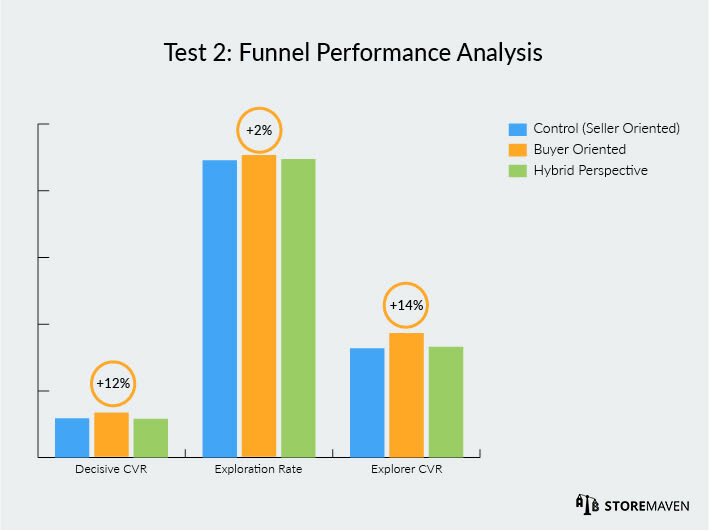 Hence, in order to draw actionable insights from Test 1, we sought to answer three main questions about Explorers with data from the first test. Does scrolling the Gallery encourage Exploring Visitors to install the app, or does it encourage them to drop? We compared the ratio of Gallery scrollers for Exploring Visitors that installed versus those that dropped. We saw that in Wallapop’s Control Variation, scrolling the Gallery was an action more prevalent among Explorers that dropped. In the StoreMaven Variation, we found that Gallery scroll was an action more prevalent among Explorers that installed. The low Explore & Install rates seen in Wallapop’s Control Variation is a clear indication that the Gallery did not meet the expectations of the common Exploring Visitor. What is the click-to-enlarge rate of each screenshot in the Gallery? Based off millions of tests we have run on the App Store, we are able to conclude that when users click on a screenshot in the Gallery, it comes with a high chance that the visitor will drop (i.e. negative correlation with installing the app). Therefore, by analyzing the click-to-enlarge rate of each screenshot in the Gallery, we are able to identify unhealthy user behavior patterns and further pinpoint the cause. 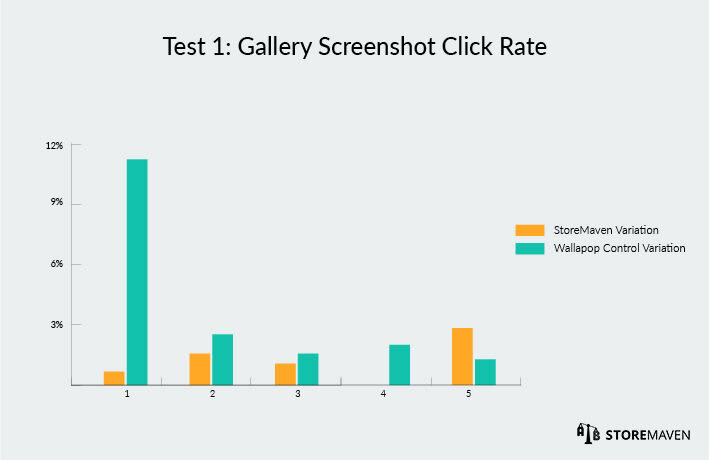 As demonstrated above, every screenshot (except the last screenshot) in Wallapop’s Control Variation, created significantly higher click-to-enlarge rates. From this data, we can conclude that the Control Variation saw a high click-to-enlarge rate due to the fact that the details in each screenshot were too small to see without clicking, while the screenshots in the StoreMaven Variation spoke for themselves. What was the Screenshot Conversion Rate (the rate of installers that were exposed to that screenshot during their Product Page visit) for each screenshot? As depicted in the graph above, the StoreMaven Variation outperformed Wallapop’s Control Variation throughout the Gallery. Interestingly enough, the performance trend of both Galleries was almost identical, except for the fifth screenshot in which the StoreMaven Variation created a lift in the install rate from the fourth to the fifth screenshot. There are several insights we can draw from the results of Test 1. 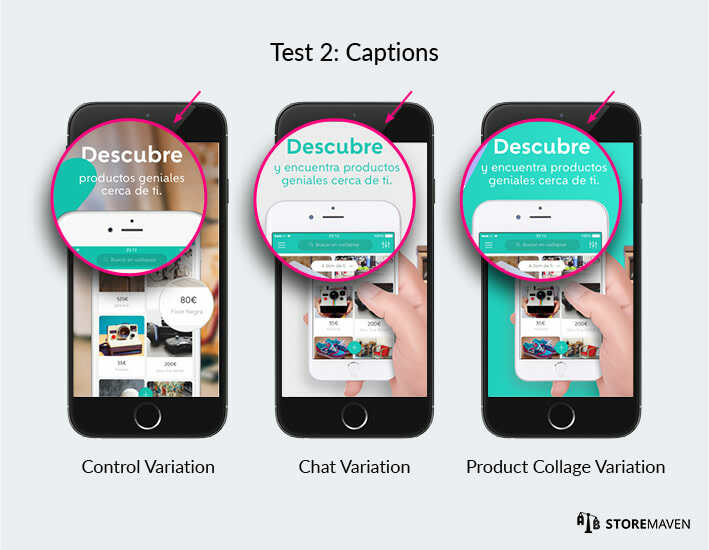 The goal of the second test was to optimize Wallapop’s App Store Product Page by implementing insights from the first test while testing new messaging. More specifically, we saw that in Test 1, we were highly successful at converting Exploring Visitors, so we wanted to increase the Exploration rate in order to convert more Exploring Visitors. We also wanted to increase the Decisive CVR, which was unaffected in Test 1. Since the new control variation included a panoramic First Impression Frame that depicted app utility for the seller, we decided to test two other variations that addressed app utility for the buyer and a hybrid geared toward both buyers and sellers. 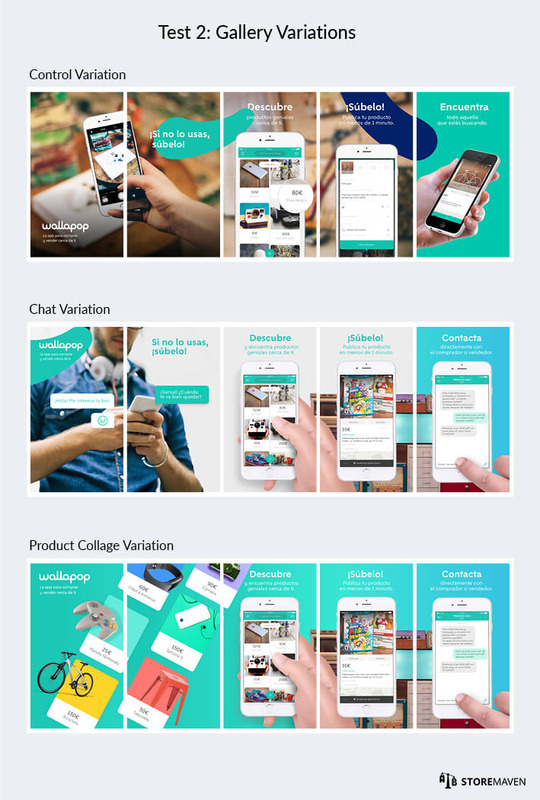 “Chat” Variation: Depicting app utility for the buyer by means of lifestyle-oriented screenshots will increase Gallery scroll and increase Decisive CVR. “Product Collage” Variation: Depicting app utility for both buyers and sellers by means of portraying inventory variety will increase Gallery scroll and increase Decisive CVR. 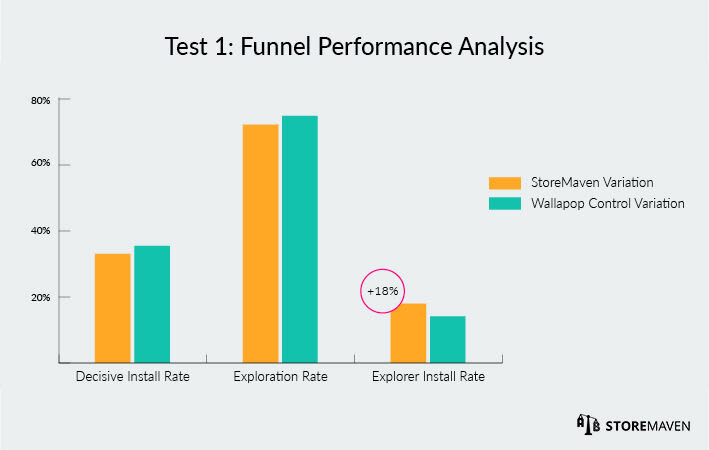 The Chat Variation created the best First Impression in all metrics, lifting the Decisive Install Rate by 12%, Exploration Rate by 2%, and Explorer Install Rate by 14%. 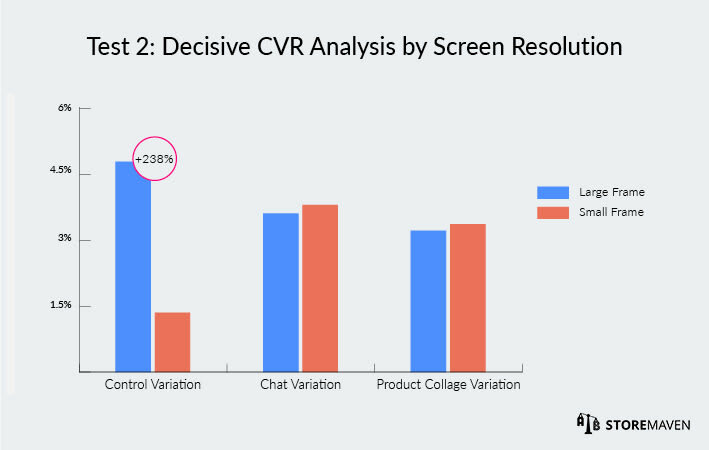 In order to more thoroughly analyze the Decisive CVR, we further broke down these figures by iPhone screen resolutions (small screens and big screens). By doing so, we were able to find points of failure. 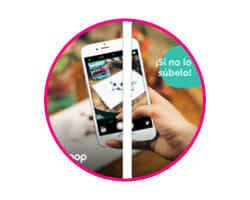 iPhone 5 and iPhone 4 have small screen frames, which can cut out parts of the First Impression Frame. 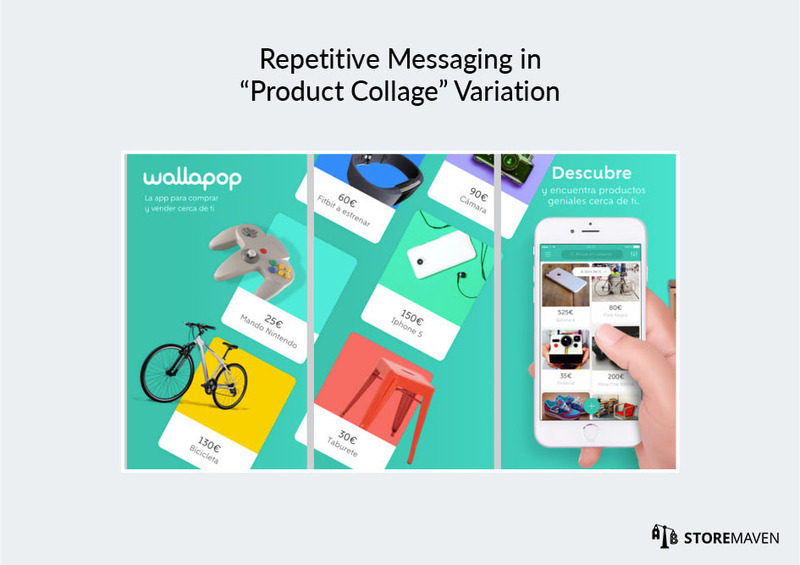 The messaging in the First Impression Frame for the Chat Variation and the Product Collage Variation were not harmed by the smaller screens. However, messaging in the First Impression Frame for the Control Variation was disturbed. 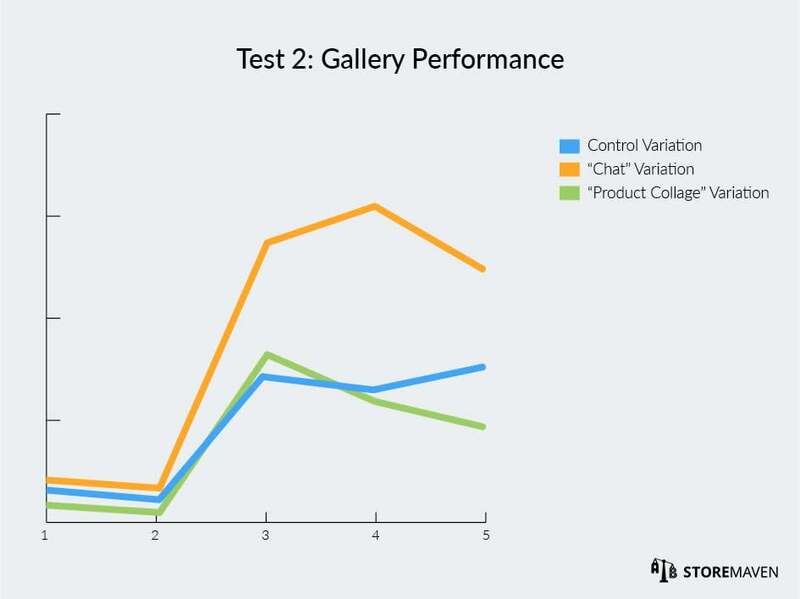 When we looked beyond the First Impression Frame and analyzed overall Gallery performance, we saw that the Chat Variation also outperformed the other variations in every screenshot. Not only did the Chat Variation have the highest CVR for each screenshot but it also had the sharpest increase throughout the Gallery. There are three major insights we drew from the results of Test 2. Notice in the image above how the contrast between the caption and the background can affect readability. The easier designers make it for App Store visitors to read the captions, the greater the chance visitors will actually read and understand the Gallery storyline. The Chat Variation had the best contrast, which is one reason that variation enjoyed the highest CVR per image. We have seen through various tests that visual repetition often leads to higher drop rates. Notice how the messaging in the first two screenshots shows a variety of products you can find on the app, and the third screenshots repeats this messaging by using UI imagery. The Product Collage Variation had repetitive messaging in the first three screenshots, and this is likely why those screenshots suffered a decrease in CVR. It is highly important to keep a coherent message throughout the first three screenshots in order to enjoy the highest Explorer CVR. Remember, if a user scrolls past the First Impression Frame, this action is triggered by the contents found in the First Impression Frame, and that visitor expects to find relevant information as they explore the page further. 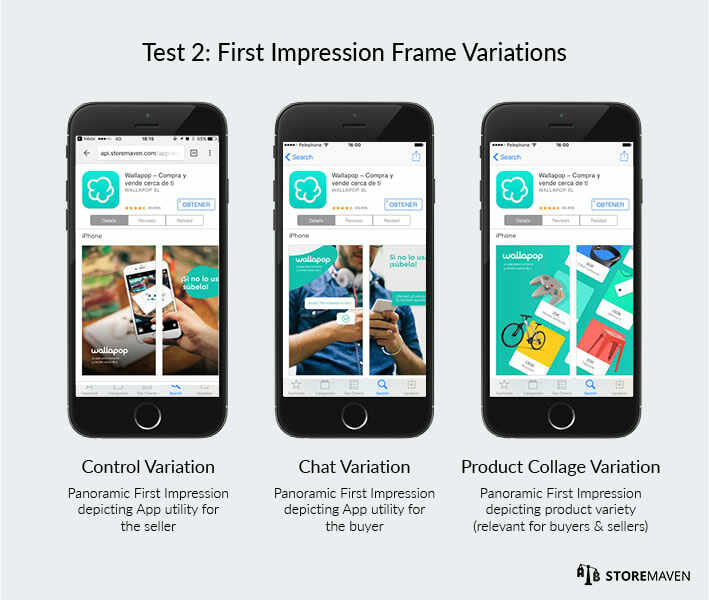 As previously mentioned, both the Control Variation and the Chat Variation used the First Impression Frame to describe app utility (i.e. the Control Variation catered to sellers and Chat Variation catered to buyers). Since the caption in the third screenshot reads “discover and find genius products near you,” this messaging helped create a coherent storyline. This explains the higher performance. App Store Optimization is a never-ending process. Hate to break it to you, but your mother was right! 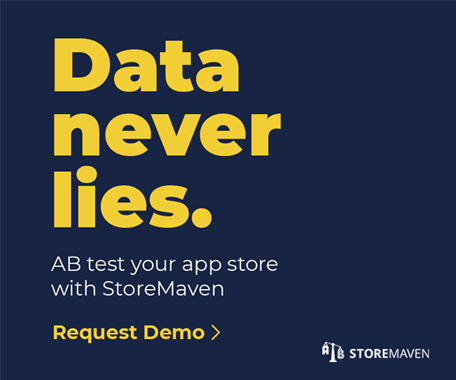 Each test points to new elements that encourage and discourage App Store visitors, and these insights should be taken into consideration for each subsequent test. Also, people and industries change over time. What works well today will not necessarily work well next month. So, what’s next?